I know what you are thinking.. beets again?! Yes folks, beets always. Because they are good to our taste buds and good for our bodies. Still in season, beets and carrots have been in abundance this past month or so, ruling our root veggie pallet with hella flavor combinations. Sometimes raw beets don't get enough love. But stained hands aside, it's one of the healthiest ways to enjoy this delish vegetable. You see, beets are an incredible source of the phytonutrients, betalains. Betalains provide a wealth of anti-oxidants, specifically that promote eye health and nerve tissue health; aid in detoxification, and present anti-inflammatory benefits. This phytonutrient is also the pigment which gives beets those rich, stained hues. All to say - the v important betalains are not heat stable. The longer you cook your beets, the less nutrients you'll receive. So! Bypass the whole problem and keep these babies raw. Fear not, because this simple and yum recipe makes that pretty easy to do. 1. 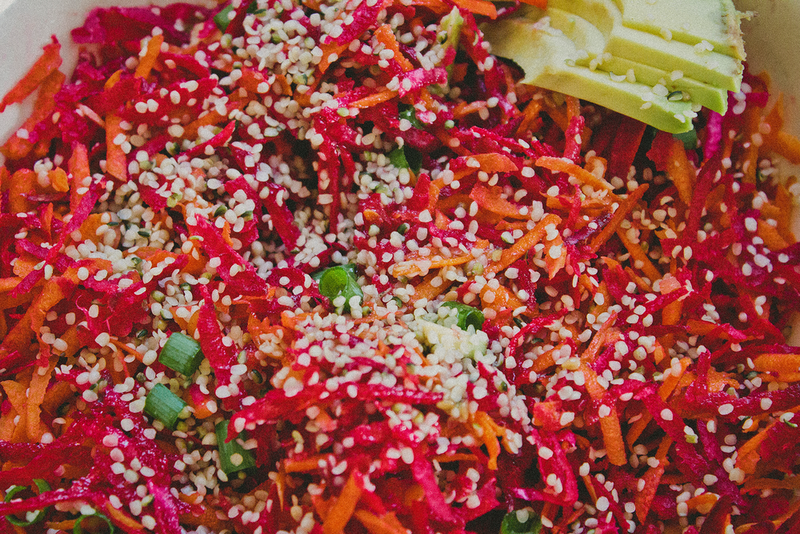 After carrots and beets are shredded in a food processor or grated by hand, transfer the veggies to a serving bowl. 2. Add chopped scallions and mint to the mix. 3. In a medium bowl or in a screw-top jar, combine lemon juice, orange juice, sea salt, cumin and olive oil. 4. Pour enough dressing on top of carrot and beet mixture to coat lightly and toss until combined. Add more if desired. 5. Add hemp seeds and avocado on top of salad and taste for seasoning.